Explore St. Augustine’s engaging historic district. Its old world look, created by the Spanish Colonial and Spanish Revival architecture of historic buildings, sets it apart from other American cities. For many, its history is confusing. Four periods of colonization by 3 countries left distinct cultural imprints, but trying to keep up with the “Periods,” who occupied it when, is dizzying. Don’t get hung up on dates. The basics are enough: indigenous Timucuans were here first. Spain established the first European settlement in America in 1565. Britain claimed it for some years; Spain re-claimed it for a few more. America acquired it by treaty in 1819 as a territory before Florida became a state. 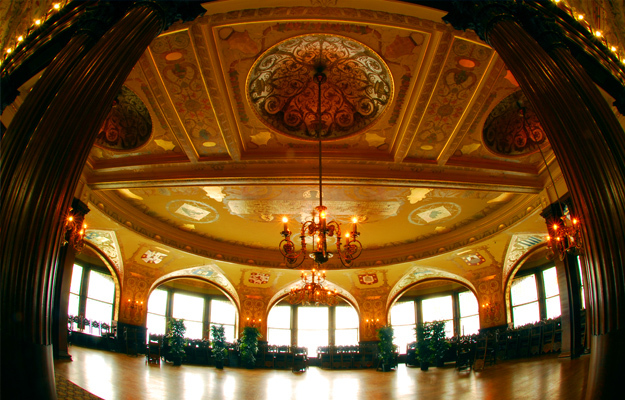 An added twist: American Gilded Age development made it a tourist destination. Catch glimpses of each period by starting Day 1 on an Old Town Trolley Tour, hopping off at the suggested stops below. Entertaining narration along the tour connects places of interest to history. The hop off/hop on feature adds flexibility. If you arrived by car, begin the tour at Stop #1, a compound with parking, amenities and a lot to see and do. Enter the Old City through ancient City Gates. Stroll up pedestrian-only St George Street. lined with a mix of historic buildings with overhanging balconies and newer ones replicating the old world feel. Attractions, a diverse mix of eclectic stores, ice-cream shops, bakeries, cafes, taverns and restaurants line the street for 11 blocks. See where kids went to school in 1788 on a tour of tiny 1-room Oldest Wooden Schoolhouse. Get an up-close look at colonial St. Augustine’s building material, coquina stone, in the wall enclosing shady grounds. Don’t miss Pirate Treasure Museum at the end of Fort Alley. Through totally engaging interactive exhibits and activities, and tons of authentic pirate artifacts, it creatively tells the story of these dastardly opportunists lurking at sea. Check tour times at Colonial Quarter or walk through colonial history on your own – 16th century fledgling Spanish port and small waterfront community, thriving 17th century Spanish town, bustling British town. Climb a watchtower, put your hands on artifacts; see a musket drill; watch a blacksmith at work. In a nod to the Spanish Periods, have sangria and tapas at Taberna del Gallo; hail Britannia with fish & chips at Bull & Crown Publick House. Leave the colonial period behind for an up-close look at America’s Gilded Age in 3 historic sites forming the “Gilded Age Triangle”: Villa Zorayda, Lightner Museum and Flagler College. Enter the romanticized world of Gilded Age excess in a house built to replicate a portion of the massive Alhambra in Spain. The unusual Spanish Revival/Moorish influenced exterior and interior architectural detail and the eclectic furnishings and artifacts reflect the exotic Gilded Age tastes of the home’s two owners, both avid collectors. An excellent audio tour explains the details. Gilded Age grandeur is around every corner of the large museum housed in the Spanish Renaissance/Moorish influenced former Alcazar Hotel, built by Henry Flagler in 1888. Take a self-guided tour of eccentric and fine decorative 19th century art, artifacts, curios, antiques, furnishings, stained glass, cut-glass, and even Egyptian mummies exhibited in grand interior spaces. Catch an antique mechanical instruments concert at 11am & 2pm in the Music Room. Have lunch in an unusual setting – Café Alcazar, located in what was once the lavish hotel’s indoor swimming pool. 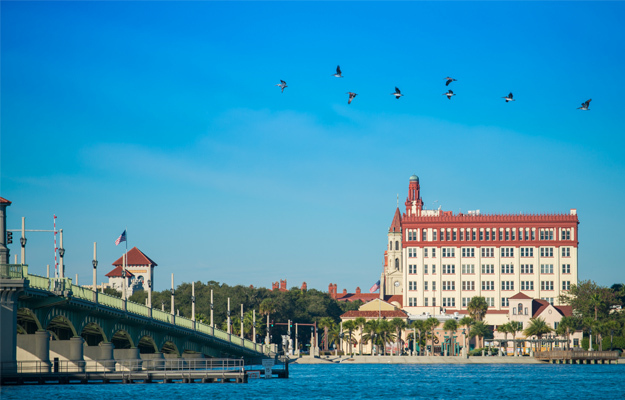 Another Flager-built Spanish Renaissance hotel, the magnificent Ponce de Leon, is now the campus of Flagler College. Specific areas – the grand lobby, dining room surrounded by 79 large Tiffany stained-glass windows, and crystal chandelier-filled Women’s Grand Parlor can be toured with student guides at specific times when classes are not in session (Summer: hourly from 10-3; rest of the year: daily at 10am and 2pm). Historic Aviles Street is a must-do “off the tourist path” walk through the oldest neighborhood in America. In addition to a large number of colonial-era private homes tucked along the neighborhood’s narrow streets are small art galleries, shops selling antiques, handmade jewelry, leather, antiquarian maps, and neighborhood cafes. Three museums housed in colonial-era historic buildings are well worth a visit. Attention-grabbing “demonstrations” of Spanish Colonial period surgical instruments, treatments, herbal medicines are great for both adult and kids. Walk through authentically furnished and accessorized rooms of the historic colonial-era home as it was when it was a popular boarding house. A a short, pleasant walk from the south end of Aviles, centers a beautiful walled property. Architecturally and through furnishings and artifacts, it’s a fine example of both the First Spanish and British periods. A Spanish family lived in the home when it was a 1-story home; a British family added the second floor. Stop #17 is nearby. Hop on to the next stop, or walk along the bayfront to Castillo de San Marcos. This is the most iconic of St. Augustine’s historic sites. The oldest masonry fort in continental U.S. was built by the Spanish in 1685 as a walled defense line around the settlement. Wander through fort casements on a self-guided tour, see exhibits and a video on cannon and musket firing. An expansive property overlooking the marsh, thought to be the site of the first settlement and speculated to be have been explored 48 years earlier by Ponce de Leon, offers more than a sip of water from the legendary fountain. The site pulls together the early portions of St. Augustine’s history through multiple life-sized outdoor exhibitions – structures of a historically correct Timucuan village, a reconstruction of the First Mission Church, a layout of the 1563 settlement field. Climb a watchtower; see how early explorers navigated by the stars. Relax over a tasty late afternoon bite to eat al fresco in 5 Flags Café. Stay in the historical grove into the evening on a Ghost & Gravestones Tour. 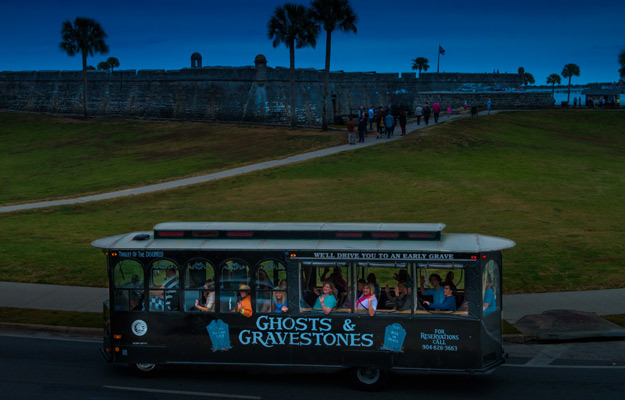 Meander slowly through dark streets as a Ghost Host on board the trolley points out places where paranormal activity has been experienced and strange happenings have occurred. You’ll be frightfully creeped out inside the Old Jail, hear things going bump in the night in the Old Drug Store, questioned who’s real and who’s not in Potter’s Wax Museum’s Chamber of Horrors. You only have to go across the Bridge of Lions to Anastasia Island to enjoy the beauty of St. Augustine outdoors. There are a couple of ways to get there. To see more, do more and have flexibility, drive. If visiting St. Augustine Lighthouse, Alligator Farm, and St. Augustine Beach are adventures enough, use your 3-day Old Town Trolley pass to hop on the free Beach Bus (BB) at Trolley Stop #16. Nature-lovers, this is one’s a must. It has it all: 4 miles of gorgeous beach for swimming and shelling; a tidal salt marsh for a self-guided nature-walk and canoeing, kayaking, paddleboarding, birdwatching. See ancient dunes; visit historic Coquina Stone Quarry archaeological site. There are great amenities too – shower facilities, Island Beach Shop and Grill, bikes, kayaks, paddleboards and more to rent. Most people come to climb the 219 wrought-iron steps to the top. Panoramic views are breathtaking and well worth the fee and the climb. Tour the Keeper’s House, see artifacts in the small museum, browse a nice gift shop. Watch the star of the farm, 15-ft Maximo, eat! See wading birds, lemurs, pythons and fossils; exotic birds, native reptiles, giant tortoises and albino alligators. Zoom high above it all on a thrilling Zip Line ride. Have quick-service snacks at TouCatina. End Day 2 with a distillery tour. Leave the beach in time to get back to downtown St. Augustine in time to catch the last distillery tours at 5pm. After the tour, chill out with wine or spirits where they’re made! They have free tours where spirits are made between 10 am and 5pm. Following the tour, have dinner upstairs in the great atmosphere of the Ice Plant while enjoying hand-crafted cocktails, bar snacks and creative small plates and entrees. The winery creates vintage varietals from Florida-grown hybrid and Muscadine grapes. Free guided tours and tastings are offered throughout the day, with the last tour at 5. After the tour, chill on the rooftop at The Cellar Upstairs Wine and Jazz & Blues Bar with live music, tasty appetizers and a selection of San Sebastian wines.